A computer is described as an electronic device that specializes in the execution of commands and instructions so as to process information. It generally consists of two major parts-hardware and software. A computer processes input segments of information using the input accessories like the keyboard, cameras, mouse and other devices that can be attached. This device displays output by the help of output devices such as a color monitor or a printer. Generally, the size of a given computer varies considerably from very big to very small. The speed and accuracy of computers also vary. In today’s world, computers have become indispensable. Many people all over the world use computers to validate most of their daily activities. Every generation of computer is basically characterized by a heavy technological advancement that fundamentally changed the manner in which computers run and operate, resulting in increasingly more powerful, cheaper, smaller, reliable and efficient devices (Gary ,Shelly, Thomas,Cushman,Glenda,Gunter,Randolphand Gunter, 2001). This paper seeks to lay crucial emphasis on the evolution of computers right from the time they were first discovered to the present day technological advancements. Still on the same, it will deliberate on the impacts of the usage of computers in different sectors of the world’s economy. The paper will forward instances of the areas and ways in which computer usage is abundant. 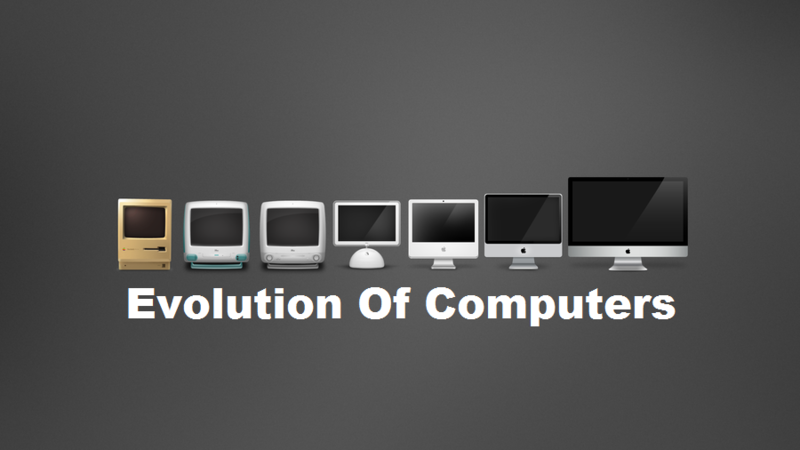 The history of computer evolution is usually referred to with constant reference to the various generations of computing devices that were involved. Each stage of computer generation was characterized with an important development (technological) that greatly changed the modes in which computer operations are handled. This resulted to increasing the probability at which these technical devices are available to the individuals in the world. These particular developments have played a major role in making the computers cheaper for affordability, smaller for portability and convenience, more powerful for better results and reliable for durability reasons. Computerized devices have been around longer than many individuals might imagine. The term “computer” has rapidly changed meaning over years. However, the electronic computer which is thought of in modern times, evolved throughout the 20th century. Its popularity of being a household item intensified in the 1980s after the arrival of operating systems by major software companies including Microsoft and Apple that mixed text and graphics. This was to replace the text-only systems that existed since the 1970s. By the 1990s, electronic computers incorporated enhanced multimedia and communication applications and developed into an indispensable aspect of life of so many people. Early Computing was an aspect that was narrow and the usage was considerably low as computers were at their initial stages of development. The original description of the term “computer” was an individual who made calculations. This description dates back to the 1600s and travels midway through the major development in the 20th century, when the word “computer” began to describe a machine. A computer is on the same basic aspect as the abacus, which also dates back many centuries ago. Technology made a major leap with cards that were punched, being introduced by Joseph-Marie in the year 1801. It is interesting that such an early use of the computer system involved music. In 1835 Charles Babbage incorporated a steam engine with punched cards to invent what was termed as an “analytical engine.” Mechanical Information Processing was a concept that was later combined with the existing system to further develop the computer system. In the late 1880s the IBM Company developed out of the discovery of the tabulator which was crafted by Herman Hollerith. This was the very first use of punched cards that represented data rather than the use of punched cards that automated a mechanical function similar to that of a player piano. Through the 1950s the information processing world utilized a combination of punched cards on the key punch and tabulator machines. The first forms of mathematical calculators were discovered in the 1930s. Throughout the World War II era, analog computer machines began to be replaced by the digital ideology of ones and zeroes. Made by Remington Rand in 1951, the first computerized device made for the public was UNIVAC. Later in the following year IBM introduced its official mainframe computer (Rugman, 2005). The initial computer evolution stages were known as first generation computer technologies (1940-1956) also known as vacuum tubes. For circuitry, the early forms of computers used vacuum tubes and for memory they used magnetic drums. They were often enormous and huge taking up entire room spaces. They were relatively expensive to operate and maintain because of using a great percentage of electricity. During operation they also generated a lot of heat and this was often an attributed cause of malfunctions. To perform operations this stage computers relied heavily on machine language which was the lowest level programming language that computers would understand (Rojas & Hashagen 2005). This led to them having the ability to solve only one problem at a given time. Input was purely on the grounds of paper tape and punched cards while output was displayed on printouts. The ENIAC and UNIVAC computers are the best examples of first-generation computers. Second Generation computing devices (1956-1963) made use of transistors. Transistors then replaced vacuum tubes and introduced the second generation of computing devices. The transistor was superior as compared to the vacuum tube, allowing computing devices to become cheaper, smaller and faster. They were therefore more efficient than their predecessors.Although the transistor also generated a considerable amount of heat that could have otherwise subjected the computer to mechanical risk, it was a great improvement over vacuum tube usage. Second-generation computers also relied on printouts for output and punched cards for input. Second-generation computers evolved from cryptic binary machine language to an assembly, or symbolic language, that allowed programmers to identify illustrations in words. High-level programming languages also developed at this stage, such as ancient versions of FORTRAN and COBOL. They were the first form of computers to store their instructions in their own memories, which shifted to a magnetic core from magnetic drum technology. Third Generation computers (1964-1971), utilized integrated circuits to enhance their performance. The discovery of the integrated circuit became the hallmark of the third generation stage of computer evolution. Transistors were placed and miniaturized on silicon chips, known as semiconductors which rapidly increased the efficiency and speed of computers. Instead of punched printouts and cards, developers interacted with third generation technology through monitors and keyboards and interfaced with operating systems, which allowed the computer to run several different applications all at one time on a central program that closely monitored by the memory. For the first time computers became accessible to a greater audience because they were relatively smaller in size and cheaper than previous generations. The fourth Generation (1971-Present) broadly made use of microprocessors. The microprocessor brought by the fourth generation computers, thousands of integrated and linked circuits built onto a one silicon chip. What filled an entire room in the first generation could now ably fit in the palm of a hand. This meant that smaller space would be occupied by these new devices. As these computers (smaller in size) became more powerful and efficient, they later on had the ability to form networks, in which could be linked together. This led to the development of the worldwide Internet in the long run. Fourth generation computers also propelled the development of handheld devices, the mouse and GUIs. The fifth Generation (Present and Beyond) has invested more on artificial intelligence. Fifth generation computers were developed on artificial intelligence and are still under development, even though there are some programs, such as electronic voice recognition that are currently being used presently. The use of superconductors and parallel processing is facilitating the making of artificial intelligence into a reality. Nanotechnology, molecular and quantum computation will drastically change the phase of computers in future. The objective of the fifth-generation computing devices is to develop computerized devices that are compatible to natural signals and have the potential of self-organization. (Godse and Godse, 2004). Computers have been applied in many different sectors to facilitate the efficiency of information processes. For a long time now, scientists and developers have forwarded theories and ideologies that have been adopted to develop many differentiated tasks that can be performed by the computers. Since time in memorial, devices have been created to facilitate communication. In the second generation of computers, there was the need to diversify and attach extra features to the computer to enable it do more tasks. One of the tasks was to facilitate the transfer of information. Communication is by far the most basic requirement for human survival. Human beings need to communicate to develop and ease their life styles. Computers have in the long run been used to aid in communication in various ways and forms in the society today. Through the sending of e-mails from one computer to the other, both the recipient and the sender are able to exchange information (Shelly, Cushman, Gunter & Gunter, 2003). The exchange may be beneficial to different descriptions of persons in the community in different ways. In the education sector, students and scholars are enabled to acquire information in a more efficient and quicker manner. Through the access of internet, people from all over the world are able to access information on the developments in the education sector freely. Students can also apply for admission to schools that have a reputation of worldwide quality standards. Computers have been used to communicate messages throughout the world. Computers have been used to write and transmit newsletters and memos within and also without a given organization. There are other several uses applications of computers which are dependent on the sector they are to be employed. Computers can be used in word processing and related tasks (Hasselbring & Glaser, 2001). A word processing program automatically corrects grammar and spelling mistakes and errors. If what is contained in a document is repetitive, there is no need to type it each time. The user can use some features in the computer known as ‘copy and paste’ features. The documents can be printed out into several copies. It makes it easier to read and analyze a word-processed document as compared to a handwritten one. The user can add images and templates to the document depending on the complexity and skill of the user. The internet creates a common ground of reference and computer networking all over the world. The internet is a network of so many computers in the world. One is in a position to browse through more information and studies than what is available in a physical library. This is because computers are able to store huge amounts of processed information. The user can also have very convenient and fast access to up to date information (Hwang 1999). Through E-Mail services, communication with a person sitting hundreds of miles away in minutes is made possible. There is chat software that enables users to chat with each other on real-time basis. Other developments in the computer world such as video conferencing tools are increasingly becoming available to the common man. Audio composition or digital video are technological advancements in the field of computers that have diversified the use of computers. Video or audio editing and composition have become much easier by the use of computers. In the modern world, it no longer costs hundreds of dollars of technical equipment to make a film or compose music. Graphics engineers use computers to create full-length or short films and also to create models that are of three-dimensions. Anybody who owns a computer is in a capacity of entering the field of production especially through media. Special effects in action movies and science fiction are developed using computers. Mathematical calculations can now be done through computers. Thanks to calculators (computers solely created for calculations); both arithmetic and mathematical computing has been eased. They exhibit calculation speeds of up to a million calculations per second. As a result, we can perform some of the biggest mathematical calculations through their help. Throughout the evolution of computers, mathematical functions have been systematically integrated into computers enabling them to perform some of the most tedious mathematical functions. Computers have also developed popular demand in usage in the business world. Currently, supermarkets and shops are using software, which facilitates the calculation of the bills. This application aids in stock accountability and the determination of stock re-order levels. Similarly, taxes can be paid and calculated online. Due to the development of complex accounting computer programs, various forms of accounting are done through computers. Entrepreneurs can also predict the future trends of business and trade cycles through the use of artificial intelligence software. In larger organizations, integrated stock keeping software is used to ensure competitiveness in the stock markets. This way, the user (business people) can trade online. In the manufacturing sector, there are comprehensively automated factories that are set to run on software. Defense and security arms of the government have been greatly improved by the incorporation of computers into their systems. Computer evolution has resulted to software embedded solutions in almost all forms of weapons. In such cases, software is used for targeting in ballistic bombs missiles and controlling the flight. Software has been modified and used in the control of access to atomic bombs. These developments have facilitated the war against terrorism and the sub sequential control of ammunition and harmful weaponry. Security is a basic requirement for human life sustenance and is listed in the Maslow’s hierarchy of needs. In hospitals, the health personnel are ably connected to ensure that they are in the front line in acquisition of new knowledge on the developments and modifications to their current practices. Computers have also been used to update worksheets in various institutions. Through the automated element of the computers, they are able to continuously keep records and data at speed with the current times. Also through the access of internet these computers are by far the most accurate devices in keeping the data as per requirement. This has a number of advantages to the organization including the obvious ones of accuracy and high speed task handling. Computers also cut on costs such as those to be spent on updating data (Alt 2000). By use of computers, we can store and transfer data more safely and easily. The transfer is faster and more convenient in terms of developing channels of interaction through the internet. For instance since the fourth generation of computers, there has been a number social websites that people have used to meet individuals from all over the world and who are subscribed to them. It is without doubt that the internet has made the world a global village. The connection of a computer to the internet is by far the most considerate investment the user can make. People from all walks of life meet to share though online forums and workshops. The participators get to know what initiatives other countries and nations are putting in place to develop. In bigger organizations computers have been used to facilitate data presentation either on the company’s progress or otherwise (Freed &Ishida 2000). For example during corporate meetings, the top management puts thorough emphasis on the need to be clear and comprehensive in the presentation of research results. Computers have evolved to being in handy in developing the skills of the employees in data presentation. Computers are used to produce an acceptable form of presentation that I not only clear but also attractive and appealing. Globalization is an aspect that all economies all over the world are striving to achieve. Globalization is a development aspect that can be achieved through intensifying the application of computers in networking attempts. In conclusion, the evolution of computers has come a long way from the earliest big systems to the modern atom like laptops. Information processing has been improved so much as more advanced systems evolved. New uses of computers have been discovered as more advanced systems develop. Computers are likely to continue impacting on all aspects of humanity as we move forward. Human beings in the coming years will make use of computers to perform nearly all activities that concern their life.